Over the past two weeks, we have been counting down our Top 40 Midseason Minnesota Twins Prospect Rankings. There are many different types of prospects. There are young guys with high ceilings with a long ways to get to the big leagues. There are solid prospects who are close to being able to contribute in the big leagues who may not have high ceilings, but they have a high likelihood of reaching the big leagues. Today, we conclude the series by looking at our choices for the Top 5 Minnesota Twins Prospects and it is a good combination of those things. There is a pitcher who could be in the big leagues for a long time as a mid-rotation starter, debuting soon. There is a young, potential big league shortstop who is one stop from the big leagues but still has question marks surrounding him. There is a very young pitcher with upside as high as we’ve seen in the Twins system in a long time. And there are two really young hitters with huge upsides who are several steps from the big leagues and could still get there relatively quickly. Continue reading, and then discussing, the Twins Daily choices for the Top 5 Minnesota Twins prospects. Last offseason, Gonsalves was added to the Twins 40-man roster. Not a surprise at all as he has been one of the organization’s top pitchers each of the last three seasons. He was the Twins Daily Starting Pitcher of the Year in 2016and 2017, and he was the runner up in 2015to Jose Berrios (who also won in 2014). It was a surprise to many when the Twins had Gonsalves start his 2018 season in Chattanooga. He had ended 2016 there, and spent most of 2017 dominating the Southern League. He even made a handful of starts in Rochester. As one would expect, he pitched well. He went 3-0 with a 1.77 ERA in his first four starts and moved up to Rochester despite issuing ten walks in 20 1/3 innings. The walks have been the story and the concern in 2018, but over the course of his career control hasn’t really been a big issue. Gonsalves has certainly had his good and bad moments during his starts in Rochester. In his first two starts, he gave up a total of one run on four hits in 14 1/3 innings. He didn’t get out of the second inning in his third start. He won his next two starts by throwing a combined 10 1/3 innings. Over his next three starts, he once didn’t get out of the first inning and gave up nine earned runs in four innings. But now in his past four starts, he has given up just one run (0.42 ERA) in 21 2/3 innings. In 58 1/3 innings with the Red Wings, he has 60 strikeouts. However, he also has walked 39 batters. The long, lanky left-hander is going to pitch in the big leagues, and likely for a long time. He’s got a fastball that he changes speeds on and gets varying amounts of movement. He typically sits in the upper-80s and low-90s. He has topped out around 94 in the past. He’s got a plus changeup, and a slow curveball, similar to that of David Wells. He’s also added a cutter/slider over the last couple of seasons that can be a great pitch for him. Gonsalves is a good athlete and fields his position well. Like Gonsalves, Nick Gordon went to his second straight big league spring training. Like Gonsalves, it was surprising to many when Nick Gordon began the 2018 season back in Chattanooga. Maybe it was gaining strength to avoid a second-half slump. Maybe it was working on his struggles against left-handed pitching. Maybe it was to continue working on some things on the defensive side of the game. In 42 games, he hit .333/.381/.525 (.906) with 18 extra base hits. He was promoted to Rochester where he has now played in 45 games. He has hit .236/.255/.354 (.609). A new level means a higher level of competition. But there is little question that Gordon will hit. He may even develop into a 12 to 15 home run guy. He’s got good speed and runs the bases well. Defense is where there are typically questions with Gordon. While he has primarily played shortstop throughout his career, most believe that second base is his position in the future. While he’s got good speed, some question his range. He has a good shortstop arm. Gordon will need to be added to the Twins 40-man roster this offseason, though it is possible (if not likely) that he will be added and called up during this 2018 season. Few have risen up the Twins prospect charts in a manner as quickly as Brusdar Graterol. He certainly has a unique story. Signed out of Venezuela as a 16-year-old, Graterol impressed with an upper-90s fastball. But after just 11 innings, he blew out his elbow and needed Tommy John surgery. He missed the rest of 2015 and the entire 2016 season recovering. However, it was at Instructs in 2016 that he returned to the mound and reports indicated he was popping triple-digits. He pitched well in the short-season leagues last year, starting in the GCL but eventually moving up to Elizabethton. He began this season in extended spring training, but before April came to a close, he was moved up to the Cedar Rapids Kernels. He made eight starts for the Kernels and posted a 2.18 ERA. He was our choice for Twins Minor League Pitcher of the Month in May. He moved up to Ft. Myers in mid-June where he has made two starts for the Miracle, as a 19-year-old. So the stats are good, but Graterol is all about his right arm and its immense potential. The first thing you’ll notice is the fastball. It’s fast. If you watch him make a start, you are likely to see double-digit pitches hitting triple digits, including some at 101 mph. He also has a darting slider that can be absolutely devastating if he stays on top of it. And, on top of that, he’s got an upper-80s or low-90s changeup with good sinking movement. He throws with a smooth, easy delivery. In other words, it doesn’t look like he’s airing it out.The fastball is elite. The secondary pitches can be elite, but as a 19-year-old, they can be inconsistent. Graterol has the special kind of talent that makes people notice. While he won’t turn 20 for another six weeks, he could work his way up the system quickly. Side/Seth Note - in my 15 years of following the Twins minor league system, I have not seen a pitcher with the amount of upside that Brusdar Graterol has coming through the system. That includes Fernando Romero, Jose Berrios and - the one that gives me pause - Francisco Liriano. When the Twins drafted Alex Kirilloff with the 15th overall pick in the 2016 draft out of Plum High School in Pennsylvania, there were many scouts who felt the Twins got a steal. There were many who believed that Kirilloff might just be the best, most pure prep hitter in that draft. Kirilloff’s career began by jumping straight to Elizabethton where he hit .306 with nine doubles and seven home runs in 55 games. Unfortunately, at the end of the season, he hurt his elbow. He tried to get treatments and came to spring training in 2017. However, it wasn’t better, and the decision was made for him to have Tommy John surgery in March which cost him the rest of his 2017 season. The day after the Midwest League All-Star Game, Kirilloff was promoted to Ft. Myers. He went 1-for-6 in his first Miracle game, but he followed that with a 4-for-5 game which included a home run and five RBI. The next day, he had three more hits. He’ll experience more ups and downs with the Miracle, but the kid is a natural hitter. He has a good idea of the strike zone. He’s a good combination of understanding the strike zone and being aggressive. He’s got a great swing with a lot of power potential. Most of it to this point has been to the opposite field, but he can turn on a ball from time to time. He is a solid outfielder. While he played center field in high school, he’s played right field in pro ball, and that’s where he should be. He’s got average speed for a corner outfielder, and despite the Tommy John surgery, he’s got a strong arm. There were several names mentioned before the Twins were officially on the clock, ready to make the #1-overall pick in the 2017 draft. Brendan McKay. Hunter Greene. Kyle Wright. MacKenzie Gore. Obviously it’s far too early (maybe 10-15 years too early) to declare a winner, but it is clear that the Twins (and the fans) are happy that Sean Johnson and his staff selected shortstop Royce Lewis out of JSerra Catholic High School in Aliso Viejo, California. The Twins gave him $6.7 million to keep him away from UC-Irvine and join the Twins organization. Lewis began his pro career in the Gulf Coast League. He got off to a fast start, hitting a home run in his first pro at bat. After 36 games, he was promoted. Not to Elizabethton, but to Cedar Rapids. He had four hits in his first game, and four, multi-hit games in his first seven games with the Kernels (including two, four-hit games). He began this 2018 season with the Kernels. He has played well throughout the season, but he has really improved his game over the past six weeks. Lewis is a tool shed of talent. Lewis and his high leg kick has the potential to be a really good hitter, a line drive hitter who uses the whole field well. While he isn’t one to walk a ton, Lewis knows the strike zone pretty well and generally takes really quality at bats. Sometimes he is patient. Sometimes he is aggressive. And while the 6-foot-2, 190 pound infielder is long and lanky, he is strong. He worked out at Scott Boras’s facilities throughout his offseason, and he’s continued to work to gain strength throughout the season. As you can see from the above statistics, it’s paid off. He has a lot of power potential. He could become a 20 home run a year guy, maybe more. As it relates to Lewis, the sky appears to be the limit, so I almost hate to put any limitations on him. Speed? Well, he may not be as fast as Byron Buxton (though it’s close), Lewis can fly. He continues to work on base-stealing skills, but he’s got good instincts and runs the bases well. There are questions with his defense, but observers have pointed out that he is more advanced defensively than some of the pre-draft reports indicated. There is more of a belief that he will be able to stay at shortstop. He’s got really good range, on ground balls and on pop ups. He’s got a good arm, not Shawon Dunston-like arm strength, but he can make the necessary throws from the position. The only question right now about Lewis is why he isn’t yet in Ft. Myers playing for Ramon Borrego (his GCL Twins manager a year ago). I don’t have an answer for that. It’s hard to argue that he is making adjustments during the last six weeks to add power which will help him at the next level and beyond. Are comparisons to Derek Jeter fair? Probably not. But are there a lot of physical and personality traits that are similar to the future, first-ballot Hall of Famer? Absolutely. That’s the level of talent that Royce Lewis has. Great prospect list, I was fortunate to catch a few of these in Cedar rapids this past fall and this spring.The future is bright, the wells not dry. Brusdar. Kiriloff. Royce. What ever Nick Gordon's rap name is, P-Schniztel or whatever. And of course Stephen. Nice set of monikers. I take it back. I wouldn’t trade Kiriloff and Brusdar for Realmuto. As I read this, Seth, I was thinking Derek Jeter.Interesting that you also made that comment. Was also thinking about your mention of 15 years.It has been that long? Absolutely love this top 3.Gotta believe they match up with the top 3 of any organization in baseball.Now to keep them healthy and get them to the big leagues. On the flip side, #4 and #5 have been somewhat disappointing this year.Both their performances and prospects for the future.Maybe they can pick it up the last six weeks of the season. I wouldn't even consider that. A quibble. Royce Lewis hasn't been "given" and talent and personality. He's worked hard and earned everything. There's some genetic lottery thing but no one is born a baseball player, they work hard and earn it. This isn't being born 7 feet tall. I'm with Seth on Brusdar over AK. Love AK but an ace-potential pitcher with that heat is the most valuable asset in the minors. If he continues to pitch well, Brusdar might be #1 by season's end. That is one happy aspect of not competing this season: there will be no temptation to make a Matt Capps-like deal with a top prospect. Very early but the Twins have thus far made the best pick of that draft. Hunter Greene has struggled so far, Gore/Wright/McKay have had mixed success on the mound as all are sitting with ERAs in the 4.00s this year (that's not so big for Gore/Greene as high school pitchers and Wright is in AA but you'd still like to see more dominance). McKay and Greene have both been unspectacular at the plate as well. It's obviously hard to hit and pitch but McKay should have been tearing up A ball but has been strikeout prone. Blayne Enlow has been holding his own - if he develops that Lewis pick under slot could be pretty ridiculous. Nice write up. Graterol is really intriguing and I hope the Twins push him a bit. It will be interesting to see how the national publications rate him in the coming months. Lewis has high upside but this review has certainly shown that, at least for now, the Twins have depth but they don't have a ton of true elite guys in the system. Lewis, Graterol and Kiriloff might be and a few other guys could get there but it's mostly a deep system as opposed to high end. IMHO. Of all of the 40+ prospect rankings, #1 was most difficult for me. I very strongly considered Graterol at #1. Just couldn't quite do it. You are correct... that was poorly worded and I actually edited it. No doubt that Lewis has worked hard for years and has earned everything he's got at this point. If an organization has three 'elite'' prospects, that's incredible. It's free, so be sure to click the link to see the order and the comments. But the four included are Lewis, Gordon, Kirilloff and Graterol... in that order. Thanks for the great write up, Seth. How great would it be to have a 2B that put up Nick Gordon first-half numbers and Brian Dozier 2nd-half numbers. I hope Twins can find out why with Gordon and I hope Dozier goes on his 2nd half terror and raises his trade value to the point we get a special player to help us soon. I love the potential of Lewis, Graterol, and Kiriloff and realize we have to be patient, but we have to find out soon what we have in Gonsalves and Gordon in preparation for 2019. And I'm not thinking September. I'm thinking mid to late July. This choice perfectly exemplifies the dilemma between floor and ceiling, or potential versus demonstrated performance. Graterol has a very large chance of being "who?? ?, oh yeah, whatever happened to him?" three years from now. But there's no denying the big fastball. I'm a little confused by this. The top three in the Twins system (Lewis, Kiriloff, Graterol) have the chance to be elite players and have as much upside as anyone in the game. If these three continue to have the success they're currently having for the rest of the season all three might end up being in the top 35 by season's end. This would be incredible considering on average each baseball teams should have 3.33 prospects in the top 100 and the Twins might have 3 in the top 35. Brusdar Graterol coming at you at 100 mph. Man, how exciting is that! A Twins pitcher with velocity? What a concept! Some exciting prospects on that list. I agree with this assessment. For me, Lewis is the only elite guy in the system right now. Other guys have a chance, but there is still a ton of risk for them. 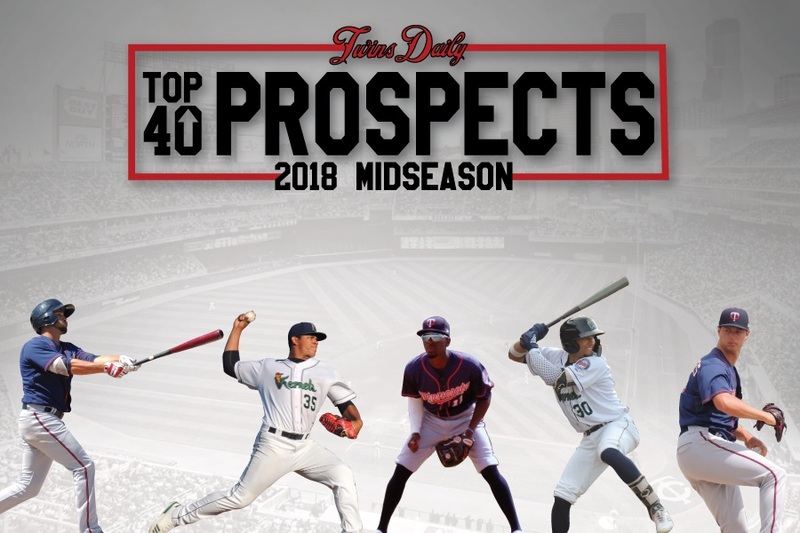 "Over the past two weeks, we have been counting down our Top 40 Midseason Minnesota Twins Prospect Rankings." it looks like he still gets plenty of arm-side movement on the pitch... it definitely wasn't straight! What's really exciting is he throws 100 and doesn't walk 5 per 9 innings! He looks under control when he pitches, which is great considering his age. This is probably more an "eye of the beholder" type thing but looking at the elite systems over the last few years, this current group isn't there. Twins, Cubs, Astros, Braves etc all had a bunch of truly elite guys. A little harder to go through the lists now that BA is behind pay walls but prospect guys were gushing over those systems as containing not just future starters but future all-star/mvp/cy young types. The 2015 BA top 100 was insane. I'm not sure the minors is as stocked right now as it was a few years ago. Those teams had (and have) loaded systems. Right now, maybe Lewis would have fit into the Buxton/Sano tier? Graterol might get there. Kiriloff will have to hit like crazy to get to that level and he's not there yet. I don't pretend to know anything special about any of these guys.I like to give a lot more weight to performance in the upper levels for hitters (Wade, Cave).I think pitchers are almost all a bit of a crapshoot, but I do have a strange affinity for freakishly tall ones (Wells).I think Vasquez is probably the most overlooked prospect at this point, absolutely should be somewhere in the top 40.It's also hard for me to understand why Cave is so low after showing good defense and a definite chance to be an above average MLB hitter with decent pop. How are Graterol's mechanics? Is he likely to blow out his arm again, like everybody worried about with Liriano?